We live in extraordinary times. Never before in the last three centuries has India received the kind of attention that she is getting today. Whichever conference I attend in the world, India’s growth is always talked about. We live in extraordinary times. Never before in the last three centuries has India received the kind of attention that she is getting today. Whichever conference I attend in the world, India’s growth is always talked about and the country mentioned along with China. There are umpteen books written about India. People ask me about the secret sauce for India’s success in software and BPO. Taxi drivers in places like New York, London and Sao Paulo ask me about how India has managed to attract the attention of the world. The figures substantiate these perceptions. We have become a trillion-dollar economy. Our exports have doubled in the last three years. Rupee is becoming stronger by the day. In July, we added 8.4 million new mobile telephone subscribers. Our FDI this year will be around $25 billion, five times of what it was two years ago. New airports are being built in major cities. In Delhi, one sees work on the expansion of metro wherever one goes. An Indian, Mukesh Ambani, was the richest person in the world for a week, and remains among the top five in the world. The list is endless. This is the time for us to consolidate this progress, work harder and smarter, and bring about an inclusive growth. We have to bring the benefits of our economic growth to make life better for all Indians, not just the elite as it has happened so far. This is possible if we focus on improving infrastructure and agricultural productivity and moving people away from agriculture to low-tech manufacturing in rural and semi-urban areas. All of these are possible if we break away from our traditional mindset, stop denying that we have problems, become open to new ideas and possibilities, and create a culture of high performance. In my opinion, openness to new ideas, ability to learn from people who have performed better than us, openness to admit problems and to accept that there is room for improvement are important attributes of an effective leader. Every year, I write on various aspects of leadership. This time, I will write about how such changes in mindset are taking place in the country from the top to the bottom. I will give some examples of how openness to new ideas is enhancing the image of this country. I will describe a few examples of how rigidity and adherence to the old mindset at certain levels of bureaucracy is blurring that image. The mindset to accept that we have problems is crucial to our progress. In my opinion, this change in the mindset is more important than the progress we see in our economy, in our physical infrastructure or in our stock markets. This openness stems from self-confidence. This openness is what will help us to accept challenges and solve the problems rather than being in a state of denial that our leaders were traditionally used to. For the first time in the last 40 years, I see a few of our leaders confident enough to accept that we indeed have problems in basic areas of education, healthcare and nutrition, that other nations have performed better than us and that we will solve our problems by working hard and smart. At the recently-concluded Asia Business Council (ABC) meeting in New Delhi, my foreign CEO friends from Asia, Europe and the US were very impressed with the openness of the Prime Minister, Rahul Gandhi, Montek Singh Ahluwalia and Kamal Nath. In every one of these meetings, our leaders were gracious, modest, confident, used data to argue their points, and did not use superlatives to describe India’s progress. They admitted that we have problems of income disparity, lack of basic infrastructure and that we have a big job to do in primary education, healthcare, nutrition and shelter. My interactions with our Central ministers indicate that this change is becoming pervasive and that one no longer sees the ghost of the argumentative Indian in our leaders as often as one did earlier. This is the start of a great journey. While I see this mindset of openness taking root at the Central level, I still see a challenge at the state levels. However, there are several good examples of progressive and open mindset among ministers at the state level too. These include Vasundhara Raje, Chief Minister of Rajasthan; Uma Bharati when she was the CM of Madhya Pradesh; and Buddhadev Bhattacharjee, the CM of West Bengal. D. B. Inamdar and H. D. Revanna come to mind when I talk of open mindsets among ministers in Karnataka. Inamdar was the Information Technology Minister several years ago when the board of governors of the Indian Institute of Information Technology, Bangalore (IIITB) was solving the difficult problem of finding a permanent home for IIITB. But for his proactive and open mindset to solve problems quickly using new paradigms, I do not think we could have got such a beautiful home for IIITB as it has today. Similarly, Revanna’s progressive policies and quick decision-making helped Electronic City get the much-needed substation to handle its power problems. 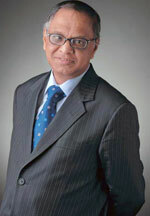 Raghunath Mashelkar, former Director General of Council of Scientific and Industrial Research (CSIR), often says that we fight a constant battle between our mind, which is the engine of problem solving, and our mindset, which is a set of beliefs and dogmas. He notes that the mindset prevents the mind from taking bold and innovative decisions based on openness to data and facts. He believes that only those minds that win the battle will make progress. I see a slow movement towards winning this battle among our leaders. While I see a fundamental shift towards openness among most of our senior bureaucrats, I do not see that percolating downwards. I will demonstrate this with two examples. The first pertains to my experiences with Shiv Shankar Menon, our current Foreign Secretary. Menon is one of the finest bureaucrats this country has produced. He is a fine gentleman, courteous, always willing to help and is constantly on the move to improve efficiency of his department. A couple of years ago, the government had issued a 64-page passport but quickly stopped that practice. Last year, I requested Menon to provide a 200-page passport to frequent travellers like us so that we did not have to get new passports every few months. This would also increase the validity of our visas, since many countries require us to obtain new visas whenever we change the passport, New Zealand being an example of this policy. I told him the 64-page passport was not very convenient, as the frequency of travel abroad was high in our industry and that we would be happy to pay the expenses needed for a 200-page passport. Being an extraordinarily openminded leader, he readily agreed and promised me that we would have such a passport. He obviously and rightly expected people in his department to handle this task. A few months later, I was informed that there would be a ceremony in Bangalore where the minister of state for external affairs would give me the first new jumbo passport. I was thrilled. 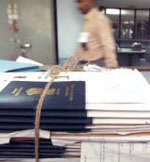 But, when I received the passport, I found that it was the same old 64-page passport! The officials present explained that it was not possible to produce a 200-page passport since the ministry press did not have a machine that could stitch 200-pages! It is surprising that at a time when India plans to land a satellite on the moon, we cannot import, if not produce, a machine that can stitch 200 passport pages. The problem is just in the mindset of the other people within the same department. This example shows how an extraordinary leader’s initiatives can be derailed by the old mindset of a few people working under the leader. This has to change. I will give you another example of our old mindset. A CEO of a very famous Fortune 500 US company wanted to get an Indian visa to participate in the Asia Business Council (ABC) meeting in New Delhi. When his office contacted the Indian Consulate General’s office in his area, his secretary was told that he would have to leave his passport with the Indian Consulate for 30 days to get a visa! He informed the ABC secretariat that his frequent travels would not allow him to leave his passport for 30 days with the Indian Consulate, and that he would not be able to attend the ABC conference. Ronen Sen, our ambassador in the US, came to know about this through a Cabinet Minister in Delhi. He picked up the phone, called the CEO, apologised and requested his staff to expedite the process. His department immediately carried out the mandatory checks and issued a five-year, multiple-entry visa, gratis, the same day. I heard endless praise for India from the CEO publicly that made the country look good in front of ABC members whose companies have a total market capitalisation of more than a trillion dollars. This is another powerful example of how some people within our government institutions have still not adapted to the changed circumstances and blur the good image of the country even though the top-level bureaucrats have made tremendous efforts to bring about a new mindset in their functioning. If we want more FDI, as the PM has indicated several times, we have to make it comfortable for business leaders from abroad to visit India. We cannot take refuge under the reciprocity issue, which is the argument used by some junior bureaucrats to justify our procedures. While I am worried that the desire for openness has still not become pervasive across all levels in our government institutions, I have come across several examples of positive change among them. The proactiveness of the income tax department people at Bangalore in introducing IT systems for filing income tax returns by our employees electronically, the extraordinary work of the Software Technology Park in being a catalyst to the IT industry all over the country, the efficient officials of the customs department at Bangalore, and the “under-promise-over-deliver” mindset of Maharashtra, Rajasthan and Orissa government officials are all good examples of such an open mindset that accepts that we can improve and takes steps to improve. How does one instill in our people the openness to accept that one could be wrong and somebody else may have a better idea? At Infosys, we realised early enough that the best way to focus on the solutions and to solve problems quickly is to start every new transaction on a zero base, without any bias from previous transaction, and to use data and facts to argue our case. Such an approach enhances the confidence of our youngsters in meritocracy, in our fairness and in our desire to be inclusive. That is why, the famous adage, “In God we trust, everybody else brings data to the table,” is very popular at Infosys.